Excellent location with direct access to the best skiing areas. 6th floor location gives fantastic mountain views from the south facing balcony and sitting room. Direct access to the piste from ski locker. There is a good sized sitting area and separate dining area. The kitchen has a full size fridge, dishwasher, oven and two ring hob. Separate bathroom and toilet. Probably the best location in la Plagne. SKIERS - The Arpette chair takes you directly to the Les Arcs link (Vanoise Express) and to the Montchevin/Les Coche area with great skiing through the wooded slopes. The Roche de Mio bubble goes straight to the Glacier area as well as a wonderful, long run down to Champany. Fabulous skiing on wide pistes and the opportunity for off-piste adventures close to the pistes. NON-SKIERS - 6 restaurants, 5 bars, Spa/Jacuzzi/Hamman, supermarket, 2 delis, cinema, heated outdoor pool, pharmacy. Good access to the many kilometres of walking trails. Getting There: With easy access from nearby airports and low cost flights (Geneva, St Etienne, Chambery Lyon) La Plagne is an ideal holiday location. The airports are linked by regular bus services to Aime. From Aime there are taxis and the local bus service up to Plagne Bellecote. Car hire from Geneva is cheaper if you hire in the French sector and avoid Swiss Motorways. All Eurostars from Waterloo and the Snow Trains stop at Aime or nearby Moutiers and Bourg St. Maurice. GLACIERS III : The apartment has a superb view facing south over the pistes. There is constant hot water and central heating. In addition to the equipment listed there is an iPod/iPad player. There is WiFi access in the apartment (pay as you go) but it is patchy. There are WiFi facilities in some of the bars in Bellecote centre itself and a dedicated internet cafe in Plagne Centre. The apartment is easy to maintain and is checked after every visit. Access to the piste is easy - from the front door you take the lift to the ground floor where the ski locker (2 metres from the door to the piste) gives direct access to the snow. There is a travelator to get you above all the lifts so that you can ski from the door! We enjoyed a fabulous week's skiing in Plagne Bellecote over the new year. The apartment was perfectly located right on the nursery slope with very easy access from the ski locker to all the main lifts and runs. Ski hire was easy too with a good shop just a few yards away. The village of Bellecote has lots of restaurants within a short walk and a Spar shop that sells pretty much everything. The apartment itself was absolutely perfect for our family of two adults and two teens. There is plenty of storage and the beds are super comfy. While it's not swish or luxurious it was clean, warm, comfortable, well equipped and very cosy and importantly, everything worked. We so enjoyed coming back at the end of a day's skiing and chilling out together. Martin the owner was great at communication and gave us brilliant clear instructions for everything. All in all a fabulous holiday and one that we can't wait to repeat! A lift down to the locker room and your on the snow. Compact, basic bijou apartment. As mentioned apartment is basic, but suited our needs. ESF ski school is great. Lessons at 9.15 to 12 and 14.15 to 17.00. 10 hour drive from Calais. Local shop is expensive so stop at the carrefour supermarket before the ascent. We know it’s one of the best located apartments in Bellecote. Thanks. Just returned from a week at Plagne Bellacote, staying in one of the apartments (Glacier 3) facing the main slopes. Apartment was small but had everything we needed including a sun-trap balcony, which was a real result - especially as 5 out of the 7 days were full, hot sunshine. The ease of ski storage, the close proximity to the shops, ski hire, slopes, lifts and restaurants was really great. Have never stayed in ski-in, ski-out before, but wouldn't settle for anything less now! Would thoroughly recommend La Plagne, this apartment and the owners were really helpful all the way through. Thanks, it's always good to hear praise for the apartment and Bellecote. The property is very convenient for family skiing with the ski locker next to the piste. The area with the 3 beds for children can be sectioned off from the main room for evening. The kitchen is well equipped, there are lots of hooks and shelves which is great for 5 lots of ski gear. Lots of cupboard space, and space to put suitcases. Great view of the pistes coming into Bellecote. Very helpful landlords. Great skiing and the easiest ever access to the slopes. Very convenient for shops, restaurants and bars. Warm and comfortable with good quality equipment, and flat screen TV/DVD. Super views from the balcony. We'll be back next year. The apartment is in the perfect location, overlooking the pistes. Three main lifts go directly to the main skiing areas – ranging from glacier to tree-line skiing. A day trip to the furthest reaches of Les Arcs (and back) is easily possible. Bellecote is a well designed centre with over 30 different services, shops and facilities, nearly all of which are under cover. These include restaurants, bars, news and tobac, spa offering sauna and various healthy/beauty courses, launderette, delis and various take-away outlets (pizzas and roast chicken). There are 4 ski hire shops, ski school and children’s kindergarden – all within 150 meters of the apartment. Outdoor heated pool, cinema, tourist info and ATM are all within Bellecote. Other facilities include 5 snow parks, a half-pipe (in full view of the apartment) and… a run on the Olympic bobsleigh as well as evening skidoo rides out along the pistes. 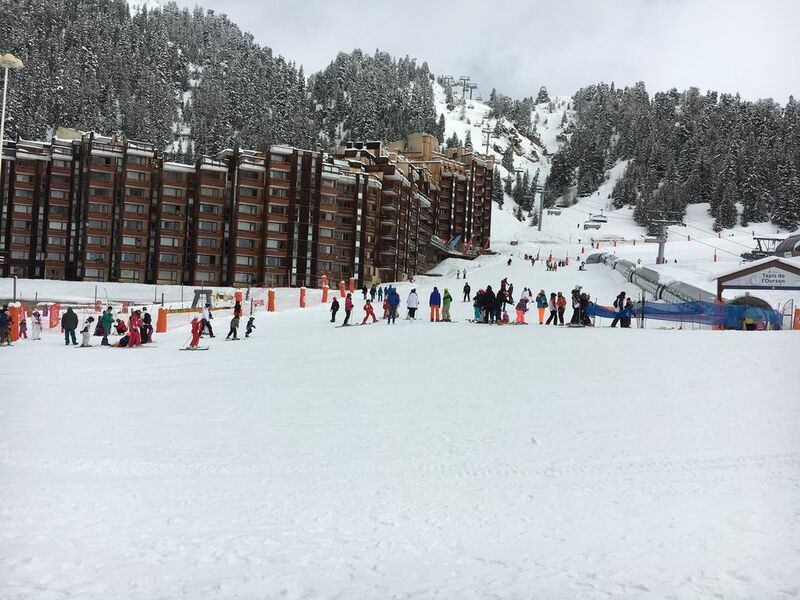 Ski: SKIING : La Plagne offers skiing for all levels. Wide long blues link all villages, whilst the Bellecote gondola leads to Roche de Mio and the Bellecote Glacier. Reds and blacks offer good long challenging runs. Off piste is good - the run from the Glacier to Les Bauches (1 vertical mile!) is stunning. Good lifts link Champagny (furthest area from apartment) to the main area. The runs down to Montchavin/Les Coches go through the very attractive wooded slopes. There are plenty of mountain restaurants. There is a kindergarten and ESF ski school in Bellecote.